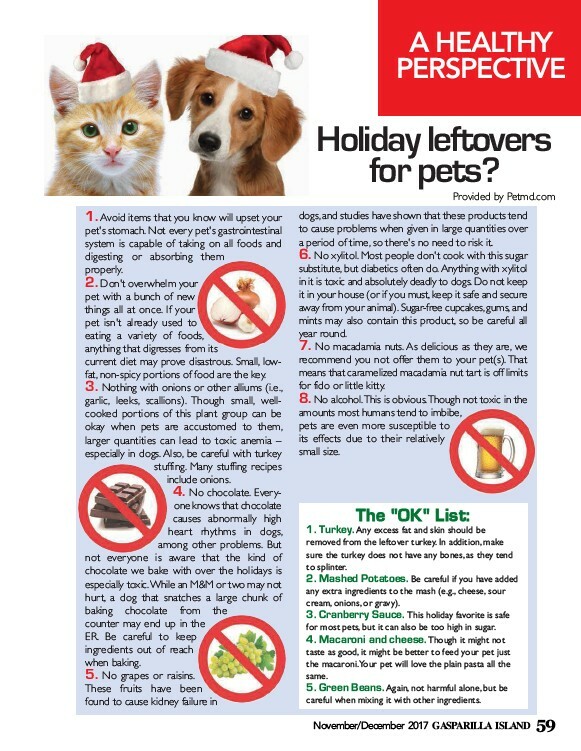 A HEALTHY PERSPECTIVE Holiday leftovers for pets? November/December 2017 GASPARILLA ISLAND 59 1. Avoid items that you know will upset your pet's stomach. Not every pet's gastrointestinal system is capable of taking on all foods and digesting or absorbing them properly. 2. Don't overwhelm your pet with a bunch of new things all at once. If your pet isn't already used to eating a variety of foods, anything that digresses from its current diet may prove disastrous. Small, lowfat, non-spicy portions of food are the key. 3. Nothing with onions or other alliums (i.e., garlic, leeks, scallions). Though small, wellcooked portions of this plant group can be okay when pets are accustomed to them, larger quantities can lead to toxic anemia – especially in dogs. Also, be careful with turkey stuffing. Many stuffing recipes include onions. 4. No chocolate. Everyone knows that chocolate causes abnormally high heart rhythms in dogs, among other problems. But not everyone is aware that the kind of chocolate we bake with over the holidays is especially toxic. While an M&M or two may not hurt, a dog that snatches a large chunk of baking chocolate from the counter may end up in the ER. Be careful to keep ingredients out of reach when baking. 5. No grapes or raisins. These fruits have been found to cause kidney failure in Provided by Petmd.com dogs, and studies have shown that these products tend to cause problems when given in large quantities over a period of time, so there's no need to risk it. 6. No xylitol. Most people don't cook with this sugar substitute, but diabetics often do. Anything with xylitol in it is toxic and absolutely deadly to dogs. Do not keep it in your house (or if you must, keep it safe and secure away from your animal). Sugar-free cupcakes, gums, and mints may also contain this product, so be careful all year round. 7. No macadamia nuts. As delicious as they are, we recommend you not offer them to your pet(s). That means that caramelized macadamia nut tart is off limits for fido or little kitty. 8. No alcohol. This is obvious. Though not toxic in the amounts most humans tend to imbibe, pets are even more susceptible to its effects due to their relatively small size. The "OK" List: 1. Turkey. Any excess fat and skin should be removed from the leftover turkey. In addition, make sure the turkey does not have any bones, as they tend to splinter. 2. Mashed Potatoes. Be careful if you have added any extra ingredients to the mash (e.g., cheese, sour cream, onions, or gravy). 3. Cranberry Sauce. This holiday favorite is safe for most pets, but it can also be too high in sugar. 4. Macaroni and cheese. Though it might not taste as good, it might be better to feed your pet just the macaroni. Your pet will love the plain pasta all the same. 5. Green Beans. Again, not harmful alone, but be careful when mixing it with other ingredients.